Clifton's of Wrexham are well known for providing an excellent service within Wrexham and surrounding areas. We provide a service to landlords and letting agency that is prompt and reliable. 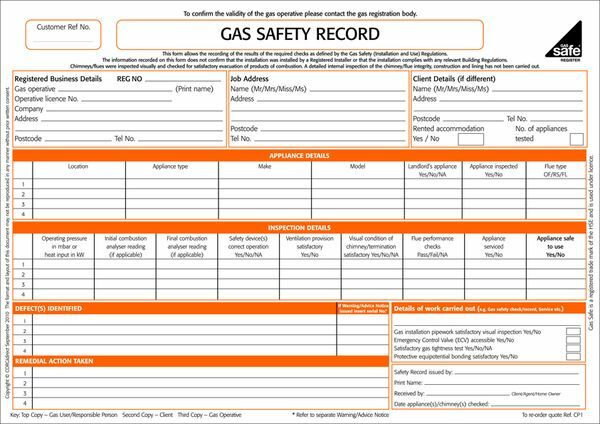 By law, under the Gas Safety (Installation and Use) Regulations 1998, it's your responsibility to get a Gas Safety Certificate every twelve months. You must get this from a Gas Safe Registered engineer for all pipe work, gas appliances and flues installed at your property. If you use an agent to manage your property, you need to make sure your contract clearly states in black and white whose responsibility it is to carry out maintenance on gas appliances. You must also keep copies of all the paperwork. You'll need to keep a record of the safety inspection for two years, and give a copy to all of your tenants within 28 days of the inspection. If your tenants change, they'll need a copy of the Gas Safety Certificate before they move in. If your contract says the agent is responsible, then the Gas Safety (Installation and Use) Regulations 1998 are passed on to them. · Legally you only have to carry out a gas safety inspection every twelve months, but it’s a good idea to get appliances checked between tenants too. Then you’ll be sure your appliances are in tip-top condition before your new tenants move in. · Installing a Carbon Monoxide (CO) alarm comes highly recommended – not just by us, but by HSE too. It’s the best way to make sure your tenants are safe from dangers of Carbon Monoxide poisoning. But an alarm should never replace regular maintenance and safety checks. · Since the 1st October 2013, it has been a legal requirement in Scotland to have a CO alarm installed in the same room as a new or replacement fixed fossil fuel burning heating appliance - this includes gas appliances. Whilst a legal requirement has existed in England & Wales since 1st October 2010 to have a CO alarm installed in the same room as a new or replacement fixed solid fuel appliance this does not include gas appliances. However it is still recommended when gas appliances are present to help ensure safety. The alarm may be hard wired or battery powered to comply. · Your gas appliances will be checked for gas tightness. · If test points are available, standing and working pressure will be tested. · Your Gas Safe engineer will check burner pressure and gas rate against the manufacturer’s data plate. · Checks will be carried out for the provision of all necessary ventilation. · Flue flow will be tested to make sure products of combustion are removed. · All flame failure devices will be checked for satisfactory operation. · Where appropriate checks will be made for physical stability, presence and effectiveness of stability brackets. · Investigations for any evidence of unsafe operation will be made and reported.